After WSMV and The City Paper ran stories on charter schools losing “struggling students” to zoned schools in time for TCAP exams, outrage has ensued among parents and charter advocates. While some parents are upset that charter students are being sent back into the school system weeks before the TCAP exam, some charter advocates believe MNPS mislead the news station because “their own scores must not be that hot this year,” “data was skewed & manipulated,” and that MNPS does not care about individual students. After I read the WSMV article, I emailed MNPS to ask for the same information they gave the WSMV reporter. 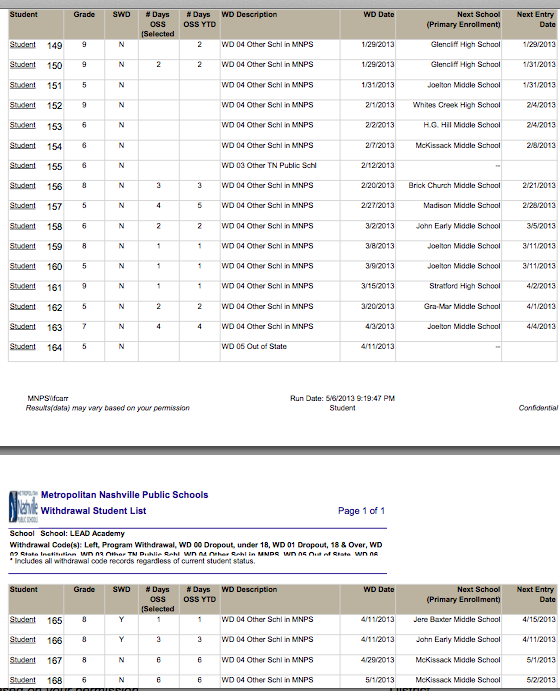 I received seven documents from the communications office including attrition rates for MNPS and some individual school reports of attrition 9 weeks before the TCAP. 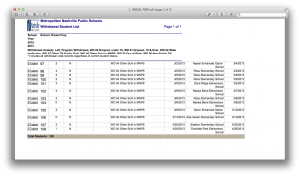 Though, after my first communication with the schools, I was told that MNPS and the principal from KIPP Academy met and the school system sent me an updated attrition document that was changed after their meeting. The numbers were a little different, but the top attrition schools were still the same. 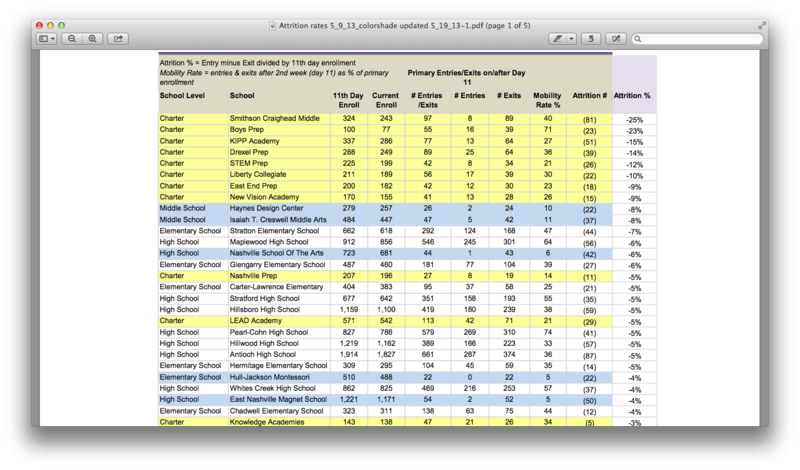 The first chart shows charter schools leading the way in attrition. As others have noted, if you have a smaller set of students, your percentage is higher than larger schools if a few students leave. 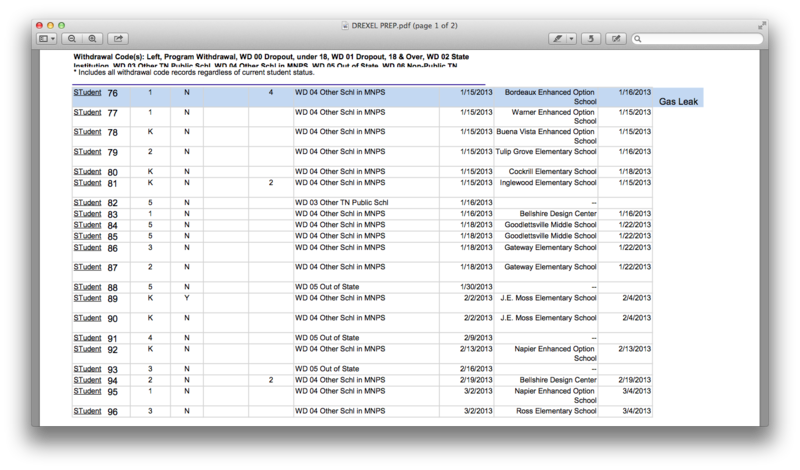 But, as you can see from the chart, there are a lot of people leaving all schools, zoned schools included. For Smithson Head Middle, out of an 11th day enrollment of 324, 89 students left while they have taken on 8 students throughout the year. The number of 81 for attrition equates to a -25% attrition rate. They now only enroll 243 students. 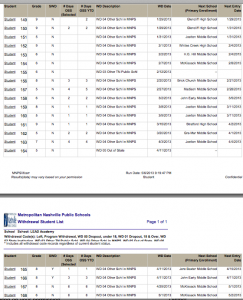 For Boys Prep, they had a smaller 11th day enrollment of 100 students. The school lost 39 students, or 39% of their student body this year. They took on 16 students for an attrition of 23 students and a -23% attrition rate. They now only enroll 77 children. 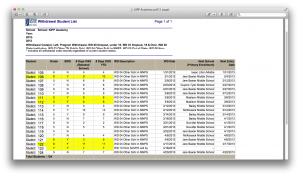 When looking at KIPP Academy, a well known charter, nationally, for it’s high standards and performance, they had an 11th day enrollment of 337. We see that 64 left while 13 came to the school during that time. 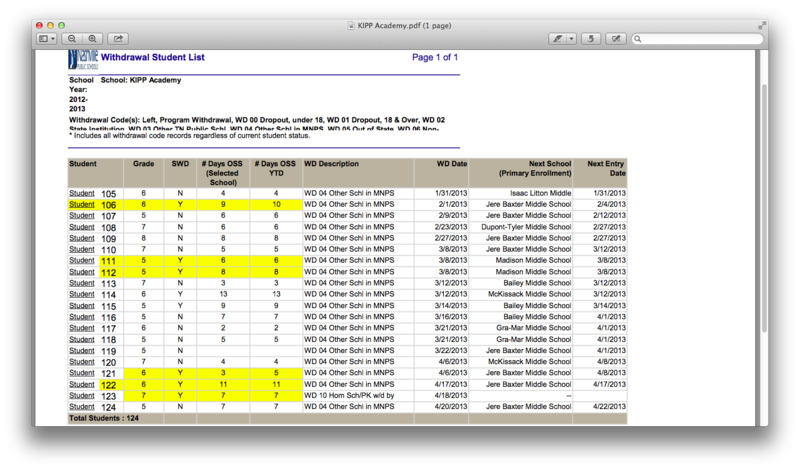 While looking at the school specifically, you can see that 20 students left KIPP Academy nine weeks leading up to TCAP. All but one of those 20 students that left had been suspended multiple times. Eight of those 20 are considered “special needs disability” students. LEAD Academy lost 20 students in the nine weeks leading up to TCAP. Fourteen of those students had been suspended during the year. Drexel had 33 students leave within the nine week period, which means that over half of the exits took place within a 9 week period. While more charter schools are on the way, we should be looking at attrition both in charter and in zoned schools. We need to keep more kids from changing schools. As many zoned schools see a large number of students leave their schools, I believe charter schools and zoned schools are different for one main reason: Charter students are not randomly chosen. While families zoned for schools aren’t technically randomly selected for their schools, it’s the best way to describe it. For charters, you have to go out of your way to attend the schools. Parents have to agree to longer schools day, to read to their kids, or other agreements along those lines. For zoned schools, it’s the exact opposite. The parents do nothing and the kids are sent to the school they are zoned to. So while many people are leaving zoned schools, it looks strange to see that parents would go out of their way to enroll their children in a new program to only move to a different school at a later time. I wanted to show the numbers from my high school for two reasons. One, because there are many people coming and going from zoned schools, as I said earlier. Two, to show people that I attended a school with a graduation rate of 66.9% and a dropout rate of 19.6% the year I graduated. I hear continued arguments that those families who may come from nicer areas of Nashville should not have a point of view on this topic because they go to nicer schools. First, all families should be able to voice their opinions without getting attacked for where they live. I went to a school where over half of the students are considered “Economically Disadvantaged” and hallways were lined with gangs. Does that mean my opinion matters more than those who went to (fill in the school that you always site as being better than others)? No, they don’t. When more people, both with children in the school system and not, care about our education system, it will get better. That is everyone’s goal here. We want the education of Nashville’s children to be better, some just want to get there a different way. The goal is still the same. But when people start attacking others based on where they live or where they went to school, you are undermining your whole argument. You want to give all students a chance to learn and succeed, but you won’t give all parents a right to express their ideas. Let’s continue to talk about issues that are facing our education system. Let’s continue to meet and talk with people whose idea’s are different. Let’s continue to exchange ideas between us. Let’s continue to improve our children’s education. But let’s not continue the harsh tones and attacks that we all are doing. The only way to fix our education system is working together. While I have written a post that may seem “anti charter,” (hint: it’s not) it doesn’t not mean I won’t work with charter schools to see what they are doing better than zoned schools. We can all question what zoned schools are doing or what charter schools are doing. The only thing we can do to help our education system is to be involved. Here are a few organizations you can check out to get involved in your local education system. The recently announced plan to award bonuses to high-ranking teachers if they either stay at or move to a high priority school (those schools in the bottom 5% in terms of student achievement) reminded me of a similar effort to recruit teachers to the state’s Achievement School District by paying them significantly more than they could make at other schools. In fact, I wrote about this topic when the ASD plan was announced. My first question when I heard the story was “where is the money coming from?” But it is federal money, so the state hasn’t come up with some pool of money to be used to give bonuses. And there’s no indication the program will (or will not) continue beyond the first two years. The point is, Tennessee lags behind the rest of the country in college degree attainment. And our NAEP (National Assessment of Education Progress) scores are quite low. Of 8 states that test 100% of graduates on the ACT, we rank 7th in average composite score. Improving schools in our entire state should be a top priority. And if it makes sense that you can attract more teachers (and more talent) with bonuses and higher pay, shouldn’t that simply become the policy of the state? If Tennessee became the state where teachers were very well paid and had lots of professional support (professional development, mentoring, paid training), we’d surely attract bright candidates from across the country to teach in our schools. 50 Tennessee counties border other states. Bright graduates from colleges near Tennessee would soon want to teach here because the pay and support were such a strong incentive. Metro Nashville Public Schools started using a compressed, improved pay scale this year. It helped triple the number of applicants they had for teacher openings. Why not do the same for the entire state? An investment along these lines could be a game-changer for Tennessee. We have a long way to go. But we can get there IF the political will exists to push forward. Yesterday, Tennessee SCORE sent a series of myth-busting tweets related to the Common Core. I’ve collected them here because they are helpful in understanding what the Common Core is (and isn’t). Fact: The Common Core is a set of standards which set expectations for what students should know. Myth #2: Common Core = Dumbing Down. Fact: Common Core is more rigorous than Tennessee’s old standards. 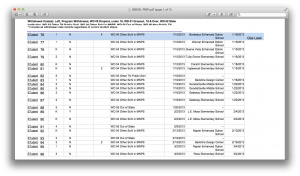 Myth #3: Common Core Compromises Student Data. Fact: Information tying student to data cannot be released. Fact: Teachers will teach classics, as they always have. This is a well-done rebuttal of some of the more common anti-Core arguments. SCORE has done a more thorough myth/fact sheet and you can find it here. Groups and individuals from across the political spectrum have endorsed the Common Core as the basics our students need in order to be college and career ready. It’s got bipartisan support and buy-in from 46 states. How each state implements the Common Core will make the difference in its success there, but the guiding principles are solid and the potential for positive change is strong.